Not knowing the facts on flood insurance can end up costing you your life savings. Review the flood insurance myths we debunked so you know the facts about how to protect your biggest assets. Myth: Flood Insurance is only for those who live in high risks areas. Unfortunately, this is not true- 25% of flood claims are for homes NOT in flood plains. While people think you must live in a flood plain to get flood insurance, this is also not true. Almost anyone who wants flood insurance can get it. Myth: Homeowner’s policy will cover flood damage. Myth: All water damage is treated the same. Certain types of water damage are covered under flood insurance, while others are covered under your homeowner’s policy. During a storm, if your roof gets torn off and rain pours in, your homeowner’s policy will cover the damage. If a riverbank overflows and damages your home, your flood insurance policy will come into play. 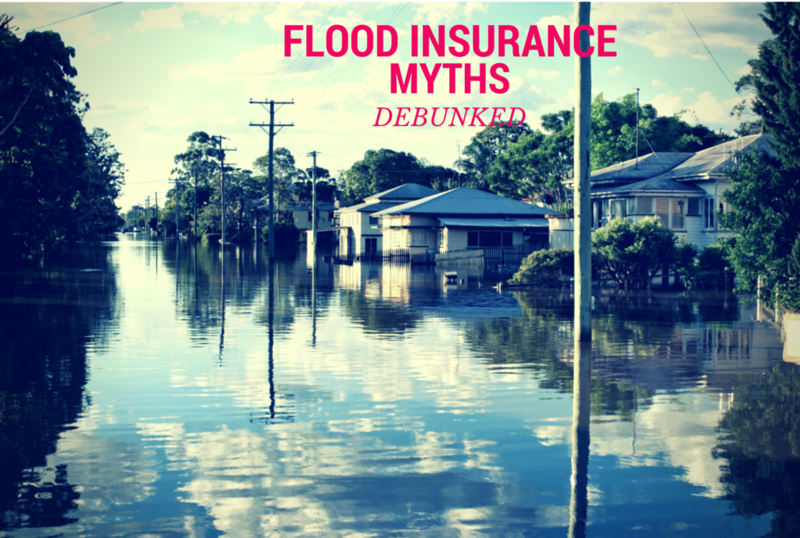 Myth: Flood Insurance covers everything. Understanding what your flood insurance covers is so important. Flood insurance policies max out at $250,000, which means if you have a 400,000 house with a total loss from a flood, the most you can recover through the program is $250,000 to cover the structure. The limit for personal possessions is $100,000 under the federal program, but you can buy excess flood insurance through a private carrier that will cover claims above those national limits. Myth: Your basement is covered. Well, yes and no. Improvements to your basement such as finished walls, floors, and ceilings are not covered, as well as personal belongings like furniture. The structural components and essential elements such as heating and air conditioning systems will be covered under your flood insurance policy. Myth: Flood plains do not change. Flood plains change and evolve over the years. Just because a few years ago your home was not on a flood plain, doesn’t mean it still is not. Check FloodSmart.gov to see if your home is on a flood plain and get information on your risks. Even more important, be sure to speak to your agent to find out details on what you need to be covered. Myth: You can’t purchase flood insurance instantly. You can buy flood insurance anytime, BUT the policy is not in effect until after a 30-day waiting period from the first premium payment paid. The exception to this rule is if the policy is bought within 13 months of a flood map revision. If the revised Flood Insurance Rate Map (FIRM) now shows the building in a high flood risk area, any flood insurance purchases will only have a one-day waiting period to go into effect. To find out more information, check out FloodSmart.gov and speak to your MassDrive insurance agent.